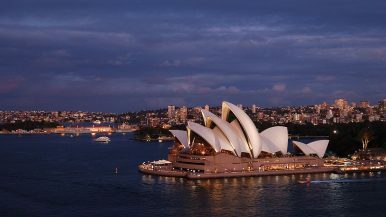 I had been longing for a visit to Australia, home to the Sydney Opera House and The Thorn Birds (my first taste of the Australian literature), and the land of koalas and kangaroos (of course!) My dream finally came true on August 15, when I landed in Sydney on a late flight from Beijing. Upon entering the lobby of my hotel, I immediately noticed that most guests were Asian, including the two ladies at the reception. When the elevator door closed behind me, I realized that two of the four passengers inside were Asian. After a short rest, I came out to meet with a former student who is now studying in Sydney. As we strolled to Darling Harbor and the Fish Market, I just couldn’t help being amazed by so many Asian faces in the streets. I had heard about the Asianizaiton of Australia long before my trip, but I was still unprepared for the near ubiquity of Asians. Asians come in different skin colors, languages, and religions, however. As a Chinese myself, I was particularly concerned about anti-Chinese sentiments in Australia, latent or potent. Though I couldn’t tell how many of those Asians I had seen in Sydney are Chinese (born in China or of Chinese ancestry), my hunch was that a large minority of them are, perhaps 30 percent. As a political scientist, though, I know perceptions — and generalizations based on perceptions — can be terribly misleading. How, then, did my first impression of Sydney compare with the facts? When I returned to my hotel room in the evening, I started checking out some statistics collected by my students prior to my departure. As it happened, the Australian Bureau of Statistics released the results of its 2016 census in late June. China has become the third largest country of birth (8.3 percent), behind New Zealand (8.4 percent) and England (14.7 percent), according to the census. Yet in terms of total population, those born in China account for a meagre 2.2 percent. When it comes to ancestry — that is, born in China or identification with the Chinese culture — the Chinese make up only 5.6 percent of the total population. Even in the Greater Sydney, which has the largest foreign-born population in the country, people with a Chinese background account for just 4.7 percent of the total population. So my perceptions turned out to be misperceptions. Neither Sydney nor Adelaide (the other city I visited) is a representative sample of the ancestral origin of the Australian population. I probably had seen too many Chinese in the streets, but once they were evenly spread out across the vast continent, they would hardly be a conspicuous presence in a land of immigrants. Does this mean that I am being alarmist about a potential backlash against Chinese residents in this country? What she described seems to be merely one of the many threats perceived by some Australians. Her article actually started with a list of these threats: Chinese money trying to influence politicians, Beijing buying advertisements to promote its foreign policy positions, and Chinese companies purchasing farms and mines. What if, however, the so-called Chinese money was legal political donation from an Australian citizen with Chinese ancestry? Don’t many governments actively and publicly promote their policy positions in foreign media outlets (i.e., public diplomacy)? Why can’t Chinese companies buy local farms and mines, as long as their transactions are lawful? Thus some Australians are facing a China choice, similar to the one some Americans are facing now. On the one hand, China has been arguably the single most important engine behind Australia’s economic growth in the past two decades. It has been the leading trade partner for Australia for many years, Chinese tourists and students have become a major source of revenues for many Australian businesses and universities, and Chinese investment (government-led or private) has created thousands of jobs. On the other hand, while the benefits (e.g., cheap Chinese imports) of bilateral trade are widely distributed, its costs (primarily lost jobs) are narrowly concentrated, and the latter has undoubtedly resulted in growing resentment among those who have been adversely affected. More importantly, being economically so dependent on China, whose political institutions and values are so different from those of Australia’s, must have deeply disturbed a large number of Australians. For them the ideal scenario would be having America fulfill the dual role of security guarantor and economic benefactor. Now that Australia is having a split personality, whither Australia and its relations with China (and for that matter America)? I have no intention of lecturing Australians about the right direction their country should take, or the right choices they should make. In fact, I do not have a ready answer to this question. I do believe, however, that as a Chinese scholar I have made at least one tiny contribution to the ongoing debate about Australia-China relations: I didn’t add to the so-called Chinese threat to Australian standards for free and open debate. If readers don’t believe me, feel free to check out my two talks at the Australia-China Relations Institute of the University of Technology Sydney and the Confucius Institute at the University of Adelaide, which should be online by now.